Alejandra Y. Castillo, Esq. | HOPE Global Forums | Presented by Operation HOPE, Inc. 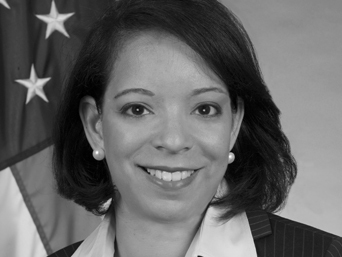 In 2014, U.S. Secretary of Commerce Penny Pritzker appointed Ms. Alejandra Y. Castillo to serve as the National Director of the Minority Business Development Agency (MBDA). Ms. Castillo is the first Hispanic-American woman to lead the Agency since its creation. In this capacity, Ms. Castillo directs the Agency’s strategic efforts to enhance the growth and global competitiveness of minority business enterprises (MBEs). Under Ms. Castillo’s leadership, the Agency has expanded its effort to help MBEs grow and succeed through access to capital, access to contract and access to business opportunities both domestically and abroad. Prior to assuming this role, she served as National Deputy Director managing the Agency’s day-to-day operations and its national network of 44 business centers. Under the Obama Administration, MBDA has assisted minority-owned firms in obtaining nearly $15 billion in contracts and capital and creating and saving over 33,000 new jobs. She has forged important strategic stakeholder relations and key public-private partnerships. Ms. Castillo first joined the Department of Commerce in 2008 as a Special Advisor to the Under Secretary for the U. S. Department of Commerce’s International Trade Administration (ITA). In this capacity, she was responsible for business outreach and intergovernmental affairs, as well as assisting in the development of policy initiatives geared at trade promotion and enforcement of U.S. trade laws. A practicing attorney for several years, Ms. Castillo has worked in the private, government and non-profit sector. Prior to joining the Obama Administration, Ms. Castillo served as the Executive Director of the Hispanic National Bar Association (HNBA) headquartered in Washington D. C. During her tenure at HNBA, she was instrumental in working with the White House, and non-profit organizations, such as the Latinos for a Fair Judiciary, in support of the nomination and confirmation of Supreme Court Justice Sonia Sotomayor. Ms. Castillo served as a member of the Clinton Administration as a Senior Policy Analyst to the Deputy Director at the White House Office of National Drug Control Policy, and was responsible for developing and analyzing White House initiatives on anti-drug traffic and interdiction, anti-money laundering policies, as well as drug prevention and treatment programs. A native of New York, Ms. Castillo holds a Bachelor Degree of Arts from the State University of New York at Stony Brook in economics and political science. Ms. Castillo holds a Master’s Degree in Public Policy from the Lyndon Baines Johnson School of Public Affairs, University of Texas at Austin; and also holds a Juris Doctorate Degree from American University – Washington College of Law. Ms. Castillo is active in a number of civic and professional organizations, including: The Hispanic National Bar Association, the Hispanic Bar Association of DC, the American Bar Association, and the American Jewish Committee. She also serves as a Board Trustee for the University of the District of Columbia. In 2010, Hispanic Business Magazine recognized Ms. Castillo among the Top 100 Influential Latinos in the U.S. and she received the 2010 Rising Star Award by the Hispanic Bar Association of the District of Columbia.